If you’re going to read Overdressed, be prepared for it to leave a nasty taste in your mouth and a lump in your throat when you next open your wardrobe. This really is a pretty damning expose of the ‘fast fashion’ industry, which churns out clothes faster than we can wear them out, leading to massive waste and a wardrobe full of clothes that we wear only once or twice. Why? Because at $5 an item, we still think we’re getting our money’s worth even if we only wear it a couple of times and then it goes out of fashion. I wouldn’t say I’ve ever been excessively fashion conscious and certainly for the last 2-3 years, I tend to only buy something when I need it. I do love shoes but even so I become incredibly attached and will wear them even when they have holes in. This Autumn, I finally threw out a pair after getting my feet soaked not once, not twice but three times! But have I bought an item in the past for $10 rationalising that it doesn’t really matter if I only wear it a handful of times? I probably have. Fast fashion is all about embracing trends but Overdressed points out that trends change so quickly that some stores are introducing hundreds of new lines each week. Therefore, clothing is becoming disposable as people strive to keep up with the new trends emerging constantly. The cost? Our clothing is gradually becoming of poorer and poorer quality. As is stated in the book, it’s now enough for something not to be lousy. We no longer strive for an ideal, we just want to avoid something awful and if we can, that’s enough. I was born in the eighties but years ago I was given a jacket from the seventies. It had already survived for years and it lasted for many more. Eventually the lining gave and I had kind of outgrown it anyway. I never managed to replace that jacket with anything near the quality. So, what’s the answer? To buy ‘quality’ brands? Not necessarily. Overdressed points out that in an investigation a $75 polo shirt was found to be little different to a $9 one. For the ‘fast fashion’ brands, pricing drops and quality drops but for the ‘premium’ brands, pricing is staying at a premium, even if the quality isn’t. Really, all I can say is read this book. You’ll draw your own conclusions and may or may not agree with everything that’s said. 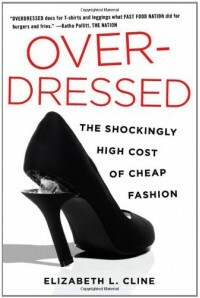 But like Jonathan Safran Foer’s ‘Eating Animals’ was a shocking eye-opener to me as a meat-eater, ‘Overdressed’ is the equivalent version for clothes buyers. So pretty much anyone who doesn’t make their own clothes. It would be naive to suggest that that’s the way forward but perhaps it’s a less frightening prospect than a world where a one-wear blouse becomes as common as a paper plate.